These homemade hot dip recipes from scratch are sure to please. The best of the best - makes great football party appetizers. These homemade dip recipes will definitely be the biggest "hit" and most requested party food at the Super Bowl or any get-together. This recipe for popper spread is such an easy appetizer to make and it tastes just like jalapeno poppers. The hardest part of this dip is not eating it all by yourself. This makes approximately 4 cups. PREHEAT oven to 400 degrees. Lightly spray a glass square dish and set aside. In a large bowl, beat the cream cheese with the mayonnaise until smooth. Add half of the Parmesan and cheddar cheese and mix well. Place in the greased dish and sprinkle first with the panko bread crumbs followed by the other half of Parmesan and cheddar cheese. Bake for 20 minutes or until golden brown. A delicious Mexican dip fit for a crowd (or a hungry family). Brown the ground beef, drain and add the remaining ingredients in a crock pot. Works well if you do this 30 minutes before you plan on eating it. Here's another popular hot dip recipe that everyone will enjoy. My Spinach Artichoke Dip in hollowed out sourdough bread. Warm, rich and gooey; so good! NOTE: There are many ways you can serve this hot dip. I use the loaf of round bread as it is a beautiful presentation. You may also use baguettes - toast them with butter and garlic. Or something as simple as your favorite cracker, it's totally up to you. Now on to more of my hot dip recipes. Mix all ingredients in a 1 1/2-quart casserole dish. Bake in oven 30 to 40 minutes. Serve with toasty rye bagel chips or party rye bread. You got to love this hot dip recipe. You may want to double this, because it doesn't last long. Place a small amount of butter or vegetable oil in a frying pan and add the raw chicken breast pieces. Add a few shakes of hot sauce, and fry until done, then add the 3/4 cup of hot sauce and bring to a boil. Set aside. Next, mix together the cream cheese and blue cheese dressing and place evenly in the bottom of a 8x11 baking dish. Then pour the chicken and hot sauce over the cream cheese mixture. Last (but not least), sprinkle the shredded co-jack cheese over it. Bake for 20 minutes, until the cheese is melted and lightly browned. Then stand back...as soon as it comes out of the oven they will be coming at you with crackers and celery sticks and it will be gone before you turn around. Trust me on this. This hot dip recipe is worth it's weight in gold. Place chicken breast halves on a cookie sheet. Bake for 20 minutes or until juices are clear. (you may also boil the breast meat) When cool; shred chicken with a fork. Place the chicken in a bowl and add the sour cream, mayo, Velveeta, jalapeno pepper, green chili peppers and taco sauce. Pour into a baking dish and bake for 30 minutes or until the edges are golden brown; and serve. Dipping ideas: Frito Scoop Corn Chips, and tortilla chips. This homemade hot dip recipe needs to be made 24-48 hours in advance for the ingredients to season properly. It's worth the wait. Serve it with sliced toasted garlic bread, tortilla or seasoned pita chips. More hot dip recipes coming up. In a small frying pan, cook the crumbled sausage until done. Place the pepperoni on paper towels and microwave to bring the orange fat to the surface. Blot with paper towels to remove the fat. In a bowl mix together the cream cheese, milk, oregano, parsley, onion powder, garlic powder and basil. Spread this in the bottom of a 9" pie plate or small baking dish. Sprinkle 1/2 cup of the mozzarella and parmesan cheese over this; then spread the pizza sauce over all of it. Add another cheese layer, then top with green pepper, black olives, sausage, and pepperoni. Bake for 20 minutes or until golden brown and bubbly. Then look out; get out of the way because they will come running. 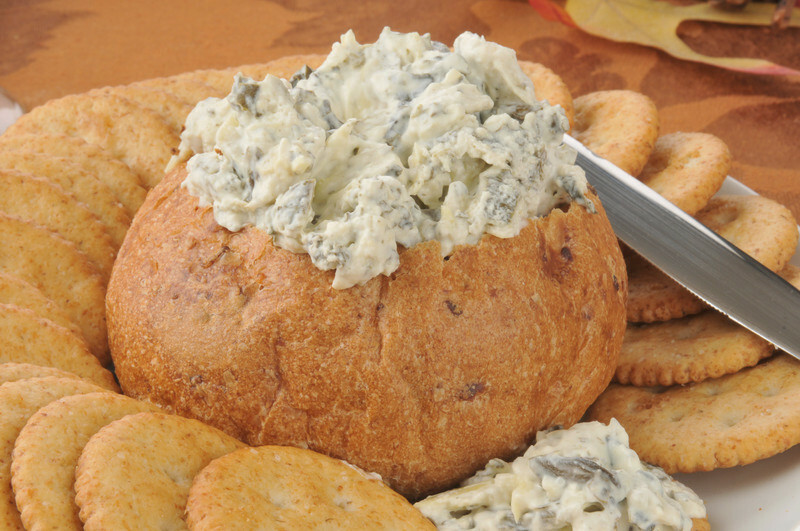 Even people that don't like blue cheese, LOVE this hot dip recipe. Fry bacon in a skillet until browned evenly. Remove, drain on paper towels and crumble. Put the minced garlic in the hot bacon grease and cook until it is soft or approximately 1 minute. Remove from the heat. Beat cream cheese and half and half until smooth. Stir in the garlic, bacon, blue cheese and chives. Place in a medium baking dish and bake for 30 minutes, or until lightly brown and bubbly on the edges. Cut bacon in bite sized pieces and fry until done. Drain and set aside. In a bowl, mix the cream cheese and mayo together. Add the garlic, cheddar cheese, Swiss cheese and green onions. Place dip in a baking dish. 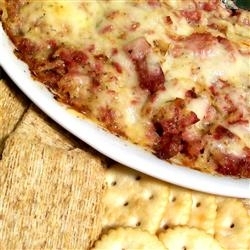 Mix the bacon and crushed Ritz cracker together and bake for 20 minutes. Serve with bread chunks or crackers. This hot dip recipe makes a savory and delicious dip. Brown your ground beef with the taco seasoning and drain; set aside. Spread all of the cream in the bottom of a baking dish. Layer with 1/2 of the fresh salsa and then 1/2 of the ground beef mixture. Again layer with fresh salsa and then the seasoned hamburger. Top with slices of the Velveeta cheese. Cover and bake for 20 minutes or until heated through. Serve with tortilla chips, sour cream, shredded lettuce, and taco sauce. NOTE: You may make this dip in a crock pot. Brown the hamburger with the taco seasoning and mix it with all of the other ingredients until hot. Serve with tortilla chips (below). Less fat than fried, these are wonderful with my dips and salsa. Bake until the tortillas begin to brown and then turn over and brown the other side. Serve with with any dip or salsa. I love this hot dip recipe. If you want it hotter, please feel free to add as much jalapeno peppers as you wish. In a bowl mix the cheese, mayonnaise, garlic, onion and half of the sliced jalapenos. Spread into an 8x8 baking dish. Season with garlic salt and top it off with the remaining jalapenos. Bake for 30 minutes or until the dip is bubbly and browned around the edges. Serve with tortilla chips or Ritz crackers. More hot dip recipes. 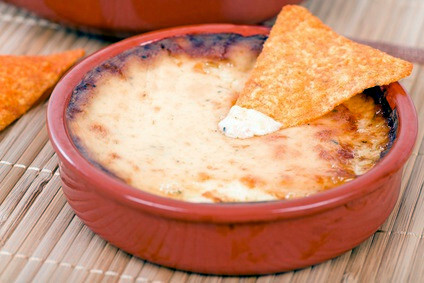 Here's another awesome Jalapeno Cheese Dip recipe from scratch. Cut the top out of the sourdough bread and hollow out the loaf, saving the torn bread for dipping. Mix the rest of the ingredients together and pour into the hollowed loaf. Bake for 30 minutes and use the torn bread pieces to dip with. You may also serve this in a baking dish instead of the bread bowl. Just use sliced crusty Italian bread to dip with. Mix all ingredients together and pour into a baking dish. Bake for 15 minutes. Serve warm with crackers or pieces of bread. PREHEAT oven to 350 degrees and grease a 9" pie plate. Spread the cream cheese in the bottom of the pie plate. Then add in order the chili, onions, chilies - top with the cheese and jalapenos and sprinkle with chili powder to taste. Bake for 20 minutes or until hot and bubbly. Serve with tortilla chips. I love these hot homemade dip recipes. 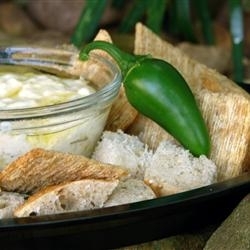 This hot dip recipe produces a dip that is a huge hit every time. Cut a circle out of the top of the loaf and scoop out the insides. Tear this bread into bite sized pieces. In a bowl combine the salsa, cheddar cheese, cream cheese and sour cream. Spoon this mixture into the hollowed loaf of bread. Place the top back on the loaf and wrap it in tin foil. Bake for 2-1/2 to 3 hours. Stir the dip once during the baking time. Serve with the bread pieces.